Fractions can be one of the most difficult concepts to understand for young learners, if they don’t have the right skills and if the new ideas are not presented well. Direct Instruction takes care of both of these pre-requisites. DI programs build methodically from one basic idea to the next, so that learners don’t have to deal with frustration or confusion. DI programs are also designed so that the basic ideas that make up something like fractions are presented as early as possible and as clearly as possible. Look over the this first exercise in the first lesson of our Fractions Fluency math program. The basic building blocks of fractions are taught from a script so that each part of a fraction is explained, with examples and non-examples. Click here to view and download the entire lesson, including 4 exercises and the student worksheets. Say to the students, Now we are going to learn about fractions. 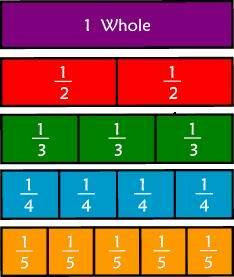 Here is the first rule about fractions. We create fractions when we divide one or more things into equal parts. Listen again. We create fractions when we divide one or more things into equal parts. Say the rule about creating fractions with me. Ready. Signal. Teacher and students say, We create fractions when we divide one or more things into equal parts. Say the rule about creating fractions with me one more time. Ready. Signal. Teacher and students say, We create fractions when we divide one or more things into equal parts. Say that rule on your own. Ready. Signal. Students say, We create fractions when we divide one or more things into equal parts. Well done. Say the rule again, Ready. Signal. Here’s a second rule about fractions. Listen. A fraction has two parts. Listen again. A fraction has two parts. Say the rule about how many parts a fraction has. Ready. Signal. Students say, A fraction has two parts. Well said. Open your workbook to Lesson #1 – Exercise #1. Touch the first problem. Touch the 5. Here is the third rule about fractions. The bottom part of the fraction tells us how many parts are in each group. Listen again. The bottom part of the fraction tells us how many parts are in each group. Say the rule with me. Ready. Signal. Teacher and students say, The bottom part of the fraction tells us how many parts are in each group. Say the rule one more time. Ready. Signal. Your turn to say the rule about the bottom part of the fraction. Ready. Signal. Students say, The bottom part of the fraction tells us how many parts are in each group. One more time, say the rule. Ready. Signal. Students say, The bottom part of the fraction tells us how many parts are in each group. Touch the number 5 on the bottom of the fraction. The number 5 tells us that there are five parts in each group. How many parts are in this group? Ready. Signal. Students say, 5parts in each group. Here is a picture of a fraction with 5parts in each group. Draw on the board or on a piece of paper a circle or rectangle divided into 5 equal parts. Listen. It does not tell me how many groups there are. It only tells me that each group will have 5 equal parts. Draw another group. If I draw another group, it must have 5parts as well. How many parts must this group have? Ready. Signal. Students say, 5 parts in each group. Draw 2 more circles. And how many parts must each of these two groups have? Point to the 5. Does this number tell me how many parts are in each group? Ready. Signal. Students say, Yes, 5 parts in each group. Point to the 5. Does this number tell how many groups there are? Ready. Signal. Good job. The number 5 tells me that each group must have 5 parts, but it does not tell me how many groups there are. Look at the next example, Q. How many parts are there in each group? Ready. Signal. We can use circles, rectangles and even number lines to draw fractions. Draw a circle, a rectangle and a number line on the board or a piece of paper all showing two thirds. Repeat for several examples until the students respond quickly and correctly. Have the students write the bottom number in the blank to how many parts are in each group.